How to make wedding flowers without flowers sounds a bit mad and although flowers are beautiful they can be expensive and if you or your partner are one of the many people who have allergies then this has to be the way to go. Plus it has not always been the case that brides carry flowers, traditionally it would have been herbs and garlic to ward off bad spirits. The most obvious alternative is silk flowers. These look just like the real thing if you buy a good quality and although this can be expensive you can always look to resell them after your wedding, or use them to decorate your home, or have them as gifts at your wedding. Rather than buy the artificial flowers look at how to make wedding flowers yourself, you can buy craft kits to make flowers from tissue paper and paper – even Martha Stewart Weddings are doing it! But you don't need one. 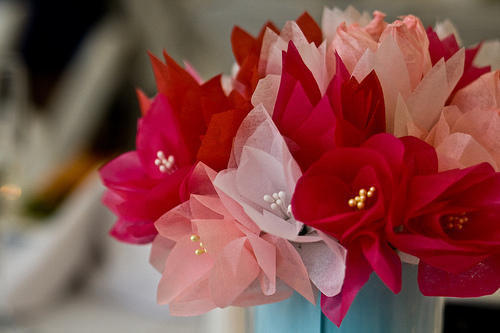 Tissue paper flowers whatever their size and at the moment the trend is as big as you can make them are easy to make. All you will need are lots of sheets of tissue paperand pipe cleaners. Lay a few sheets out flat on a table and then fold them like a fan. The tissue paper ends up in a thin line in a zigzag. Next wrap a pipecleaner in the middle of the tissue paper and then cut each end of the tissue paper into a curved or pointy shaper. This will end up being the shape of the petals. Last is the fun bit! Time to gently tease the tissue paper apart so that you have a flower. For an evening ceremony look at carrying a candle or lantern down the aisle, you could have your guests carrying them too – a beautiful way to light your ceremony. Make sure you check with the venue that they are happy with candles being used. For a beach ceremony you could have a bouquet made with shells, attach the shells to florist wire and secure together with ribbon. Ribbons are beautiful on their own and you could make a very unique bouquet from ribbons. It is traditional for a bride to have a ribbon bouquet for the rehearsal, this is normally made from all of the gift ribbons from the bridal shower and this is a cute idea but not one you would normally associate with the big day. Instead you could look at making a ribbon bouquet similar to one that Chinese dancers use in their ribbon dances, you could add an element of fun at the end of the ceremony by throwing it up, for it to unravel! You could even have all of your bridesmaids do the same. Whatever your craft of choice is I bet you could make a wedding bouquet, I have seen flowers made from felt, crystals, wool – crocheted or knitted, buttons, anything goes! And if you are not feeling crafty, ask your friends and family to help, or there is always Etsy if you want to make sure you have the prettiest bouquet!